Why Do We Love Nathan Fillion? So you love Nathan Fillion. Well, sister and/or brother, get in line: So does everyone else. Why? The obvious answer to "Why do we love Nathan Fillion?" could also describe a number of other attractive, talented actors (namely, he is both attractive and talented). These statements are both deliciously accurate, but fail to address the core issues at the center of his cÃ©lÃ©britÃ©. Perhaps I shouldn't ask why we love Fillion, but rather why we still love him: Why haven't we reached a saturation point with him yet? 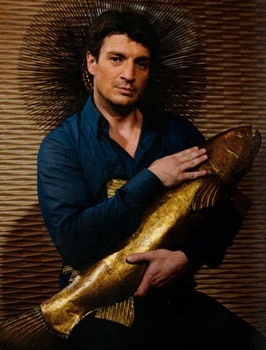 In my mind, there are four aspects to our collective love of Nathan Fillion, each of which both informs his mad staying power and is in some way reflective of society as a whole. 1. As nerds, we feel a strong sense of ownership. Nathan Fillion has been working in film and television for nearly twenty years, and the bulk of his fame stems from projects dear to the geek community: Firefly, Buffy the Vampire Slayer, Serenity, Dr. Horrible's Sing-Along Blog. His voice can be heard in Halo 3 , Halo: Reach, and Wonder Woman, and on Robot Chicken and The Venture Brothers. He may be enjoying his current fame due to his successful ABC show Castle, but we geeks can say we knew about him first. This can easily turn into a game of one-upsmanship: If you discovered him through Dr. Horrible, someone will scoff at you for not having seen Firefly, while others will dismiss you both for having not seen his work on Buffy. Someone out there fell in love with our guy in 1994, as Joey Buchanan on One Life To Live. (That someone wins.) He knows he belongs to the nerds, too, and will often show us some love, as he did by dressing up as Mal Reynolds and talking about Buffy on last year's Castle Halloween episode. This ownership unites us as a community, and helps structure our collective understanding of what it means to be a geek.Nathan Fillion can bring diverse people together. 2. He has been able to resist the lure of typecasting - to a point. If I were asked to describe Nathan Fillion's "type," I would call them all cocky, swaggering son-of-a-guns. Many of his characters play into that type, but look what he's played within that range: a crazy misogynist murdering preacher who inhabits the purest evil known to man; a rugged space cowboy who flies on the outskirts of the law; a self-absorbed, bastardly sort of anti-hero; a gynecologist who may be guilty of sexual assault; a crime novelist who (for some insane reason) is allowed to tag along behind a bunch of cops for inspiration. This may be a stretch in the eyes of some, but whenever I see Fillion gouging out someone's eye or simply explaining common abbreviations, I am reminded that there are truly a bunch of wicked different people in the world. Nathan Fillion's casting choices are good for your worldview. 3. He's good with the people. Nathan Fillion not only does his friend's web-based projects for cheap (just like we might), or thinks it's important that kids should read (just like we do, although few of us have likely founded a non-profit to make that happen), but he is on Twitter like a lion on a gazelle. Unlike many celebrities, who either don't tweet for themselves, or do so only to promote specific projects, our boy Nathan responds, retweets, wishes people "happy birthday," talks about his weekend... He's like a real live person. Very much like point #2 above, this approachability is good for my worldview; people are people. Nathan Fillion is an everyman, who just happens to be way famous. 4. He's attractive and talented. It does seem in poor taste to ignore the obvious.